From from 1 µs to 199.999 s. Resolution to 0.2 µs. DIN Rail mounted, digitally programmable. 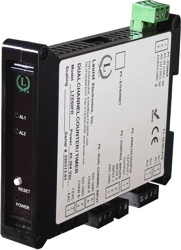 The Laureate time interval transmitter can transmit pulse width or time delay between individual pulses to a resolution of 0.2 µs for periodic events. It can also transmit average pulse width or average time delay between multiple pulses. Time interval is measured between inputs on channels A and B. Timing starts when a pulse is applied to Channel A (selectable positive or negative edge), and ends when a pulse is applied to Channel B (selectable positive or negative edge). In case of a single pulsed signal, the A and B inputs can be tied together. A positive or negative slope may be selected to start timing, and the opposite slope must be selected to stop timing. Timing is achieved by counting 5.5 MHz clock pulses. Multiple integral time intervals are averaged over a gate time which is selectable from 10 ms to 199.99 s and also controls the maximum output rate. Minimum Signal Common ground for channels A & B. Maximum Signal Nine ranges from (-12 to +12 mV) to (+1.25 to +2.1V). Contact Debounce 1 MHz, 30 kHz, 250 Hz (selectable). Time Base Accuracy 0, 3, 50 ms (selectable). Span Tempco Quartz crystal calibrated to ±2 ppm. For periodic pulses applied to A and B channels, time delays can be measured down to 0.2 µs resolution from the rising or falling edge of A to the rising or falling edge of B (selectable). The width of periodic pulses (t1 or t2) can be measured by tying the A and B channels together. As for time delay, readings are averaged over a user-selectable gate time. The start and stop pulses used for timing can be generated by the dual relay board in a Laureate panel meter, counter or transmitter. For instance, the start and stop pulse edges can be created as temperature passes two alarm setpoints, or temperature cycles in a hysteresis control mode.